L7 Comix Celebrates 1 ... Again! Holy Schnikes!!! Steve makes two appearances in a row - somebody stop the presses! ...but I'm just going to be honest right now and let you all know that it isn't going to happen right away. We've got a number of things in the works - a book, a new calendar, an updated design to our website, among others - and we're looking forward to bringing you all of these and more within time, but unfortunately life is just a little too crazy right now to dedicate ourselves to anything more than that. 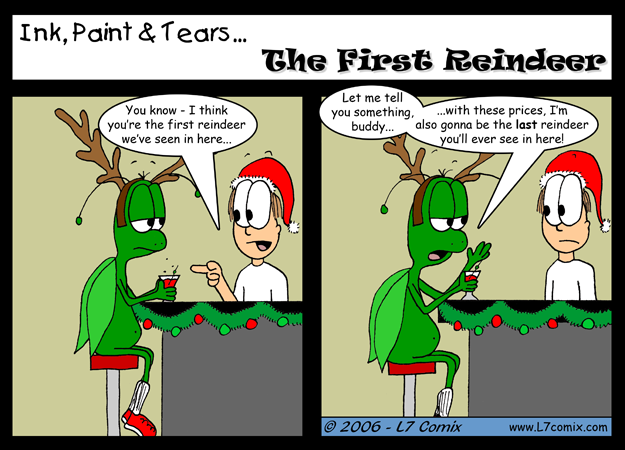 Hopefully one day soon you'll log on to l7comix.com and find a brand-new website that you've never seen before, chocked full of new features and all sorts of Ink, Paint & Tears... swag to fill your Christmas list with, but in the meantime we'll still continue to bring you what is quite possibly one of the cheesiest weekly comic strips this side of the Interweb for many moons to come! And of course, as long as we keep extending that "meantime" out, please feel free to drop us a line of any new and cool suggestions that you would like to see from us in the future and we'd be happy to see what we can do!